Luton striker Danny Hylton felt his side had looked ‘tired’ during their 2-2 draw against Gillingham on Saturday. 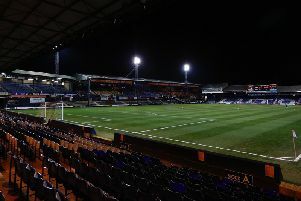 The Hatters went into the game on the back of trips to Plymouth and Bradford, where they took four points out of six. We’ve had a tough week, lots of travelling, but it was a game that we still believe we should have won. They then returned to Kenilworth Road to face a struggling Gills side and despite taking the lead twice, were pegged back 11 minutes from time by Luke O’Neill’s superb free kick. Hylton said: “I think it was a bit of a tired performance. “We’ve had a tough week, lots of travelling, but it was a game that we still believe we should have won. “We created enough chances to win the game, but you have to hold your hands up, I thought Gillingham played well and the lad’s scored a great goal. “You don’t want to make excuses, but when you’re 38 games into a season and you’ve had hours on coaches up and down the country for the last two games, it is tough. “A little something was missing, but we’ve got a week now to recover, so we’re going into Doncaster fresh. Town chief Mick Harford made just the one change for the game, Luke Berry for the injured Alan McCormack, which meant the majority of the team had started all three matches. “I’m not making any excuses about them being tired or the journeys, I thought the performance warranted a victory. “It was just things never fell for us, things never rebounded, it was just one of those days. “You’ve got to give Gillingham a little bit of credit. “I thought they set the team up well, they went man for man and made it very, very difficult for us.